The CitroCasa 8000 XB is deal for high volume establishments and produces quantity and quality you have to see and taste to believe. Because this is a high volume unit, we recommend either a bottom cart or counter top kit. Check out the CitroCasa 8000 XB/RC, it comes standard with the bottom cart. This machine is second to none for ease of use and capacity. 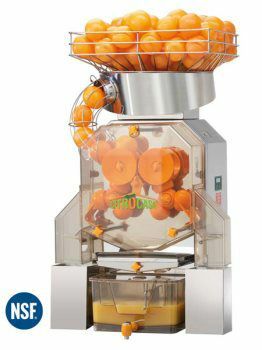 The oranges are pressed and the juice is squeezed into the attached juice tank for quick and easy access.